Spring has sprung and Easter is right around the corner. 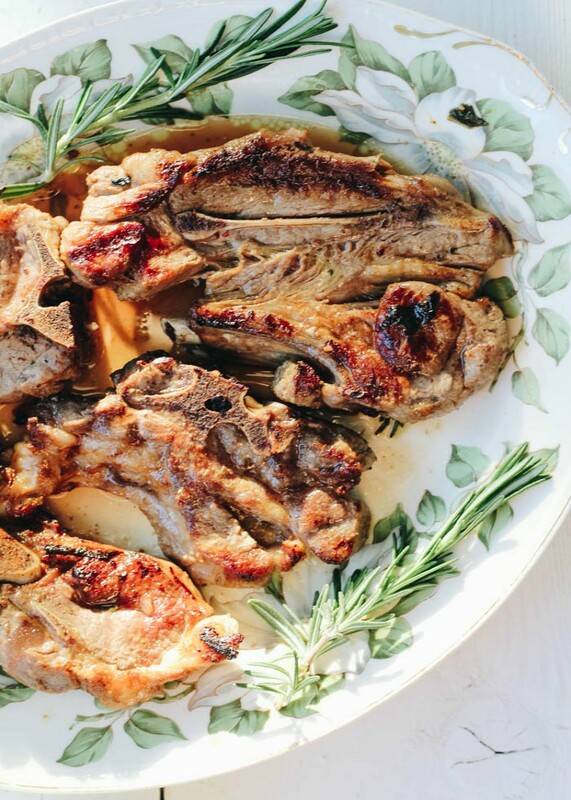 Grilled Lamb Chops with Ammoglio Sauce is something you will find here most Easters. I couldn’t believe that the weekend is approaching fast and I haven’t done much planning yet for the holiday. Easter doesn’t seem the same unless we are grilling lamb. 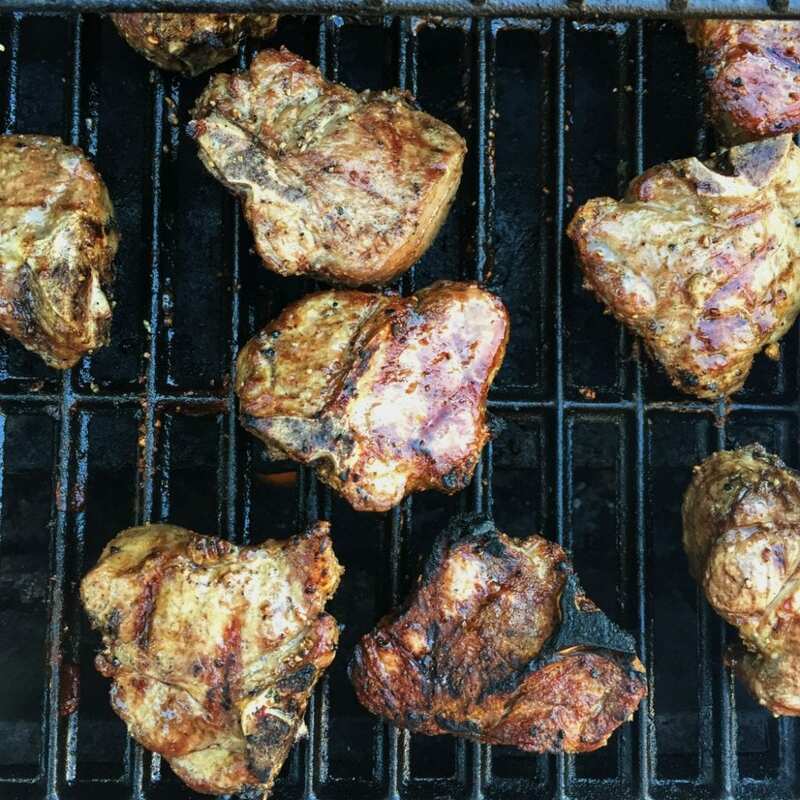 My father was the grill master and he was quite the expert at making perfect lamb chops for Easter weekend. I have to say honestly, I don’t have much of a grilling desire in me. I guess it’s because everyone around me does it so well. My husband grills. My mom grills. Even my mother-in-law grills! Really, what is there not to love about grilling? It’s seriously so easy to do and the mess is all outside. You don’t have to worry too much about the cleanup and also about the strong smells that you get when you grill inside. I do like to grill inside. I must have one or two George Foreman grills that my mom gave me and I also have a large stove top grill somewhere in my pan cabinet. But let’s talk about these chops; they are just too gorgeous to ignore! You have to make a little marinade to put on the chops and let the chops sit it in a for a bit. Our chops marinaded for about one hour on the in the fridge. After it’s all lovely and marinaded, you grill them up! While the chops are marinading, you have to whip up the ammoglio sauce that is amazing! Can we just talk a moment about my pretty serving platter? I found at my local thrift store and it is vintage American. I love the greens…so spring like! This sauce is the sauce of dreams! It truly is dreamy and wonderful. Ammoglio sauce (in Sicilian: Ammogghiu)of Sicilian origins, but I also know my Calabrian mother-in-law makes it. As with most things in Italy, this sauce varies in Sicily from region to region, family to family. It’s so simple to put together. I honestly don’t even measure as I go along, but I put together some measurements to help you along. You can adjust the flavoring to your taste as you’re making it. Like a little more garlic flavor? Go ahead! Add more chopped garlic! Like it more tart from the lemon? NO problem…one more lemon is just fine. I used some lovely ugly tomatoes that my mom brought over (they were ugly, but sweet and delightful!). Now this sauce should be made a bit before so all the flavors will sit and come together wonderfully. Of course, it was all a little last minute here, so it didn’t get to sit very long, but was still just perfect!! 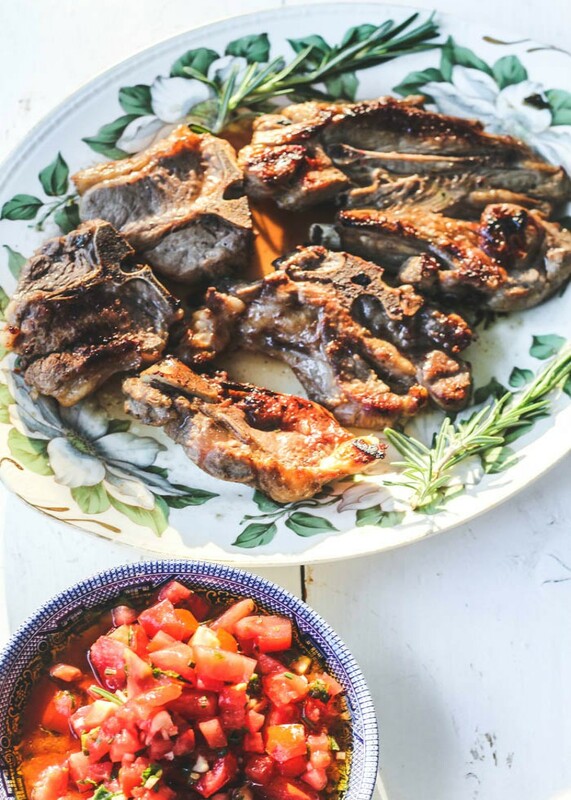 Grilled Lamb Chops with Ammoglio Sauce is the perfect dish to enjoy once the temperatures warm up. The grilled lamb pairs so well with the fresh and flavorful ammoglio sauce. In a medium bowl, whisk together the ammoglio ingredients. Set aside at room temperature for at least 45 minutes. Remove lamb from the marinade. Grill to desired doneness. When you see the markings on both sides, you can see it sweating and it’s done at medium rare (on our grill, it took about 5 minutes per side). When the lamb chops are grilled, spoon the sauce over the lamb chops on a serving platter and let it sit for a few minutes before serving. My Grandparents came to Detroit from Sicily in the early 1900s and used these same ingredients except rosemay and lemon. Also instead of dicing the tomatoes they were really mashed down to the consistency of applesauce. I use my food processor and then the extra mint stalks for a baster. We had it on steak and pork chops but usually, and it was best on grilled chicken. Grilled chicken wings smothered in ammogglio are like food of the gods!! Try it. Hi Tom, how nice of you to leave the story of your grandparents coming from Sicily to Detroit. My dad used to make chicken pieces with the sauce…it truly is delicious!! Thanks for stopping by!! that sauce sounds incredible! 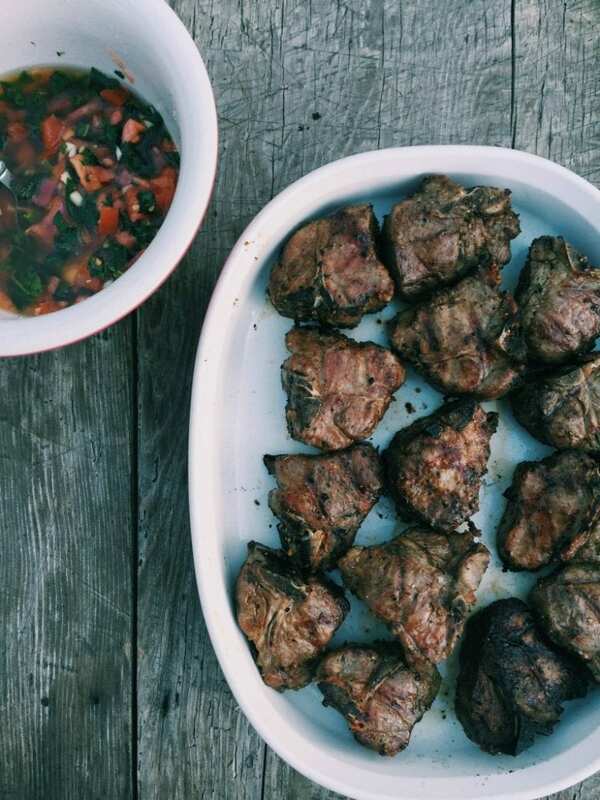 it’s been so long since i grilled lamb chops – I def need to get back out there. great recipe! lamb chops are my husbands favorite!! I gotta make him this gorgeous recipe! We love lamb!! I seriously could eat lamb every day! So good!! 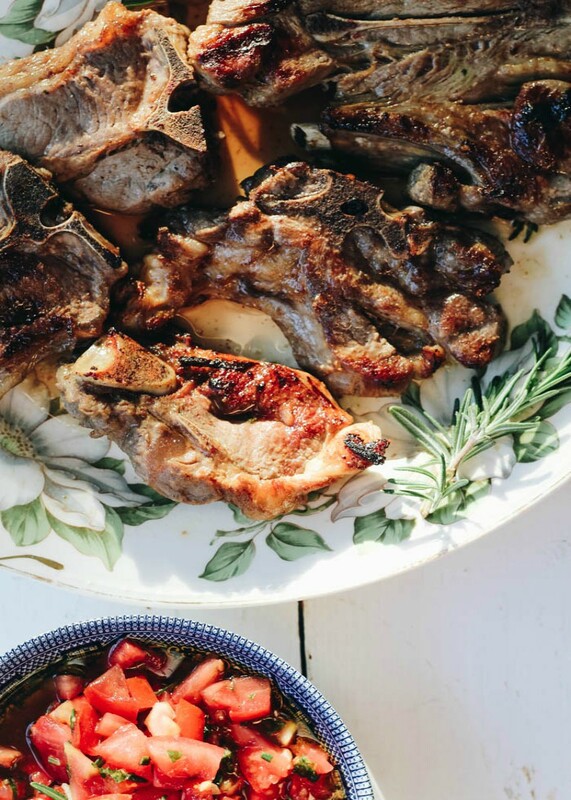 These grilled lamb chops look amazing! The perfect recipe for Easter dinner! My husband is going to get so excited when I show him this fabulous recipe! The sauce sounds amazing. 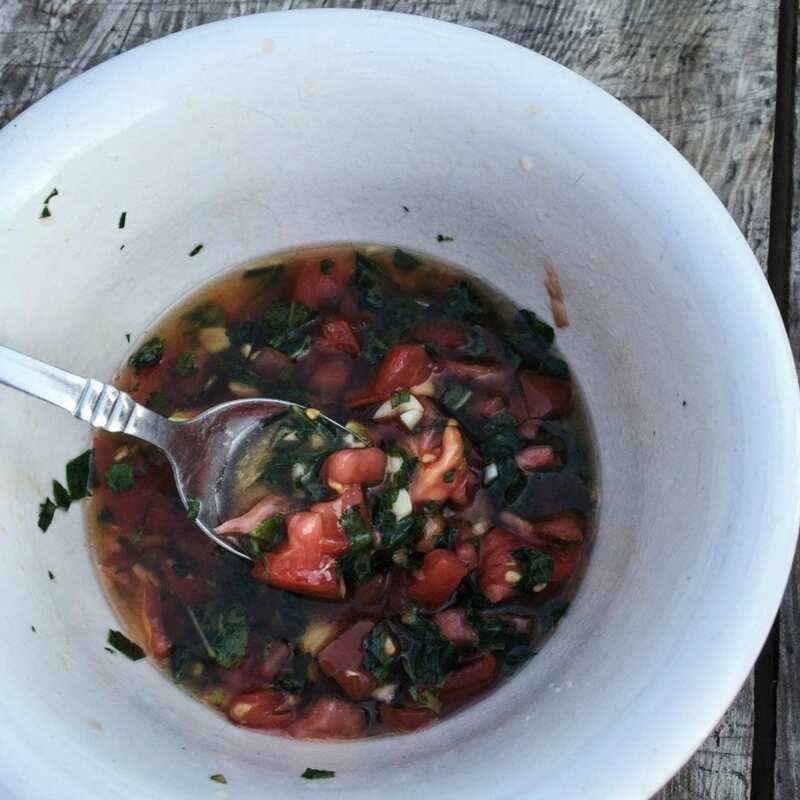 I imagine the ripe tomatoes with all of the herbs to be delicious. I love that the lamb is grilled because it creates such lovely flavor with the sweet tomatoes. This sounds divine! My hubby LOVES lamb chops but I am impartial, I will have to try them with this sauce!!! The Ammoglio sauce looks beautiful. I love that it looks good enough to eat on your own. However, I am sure my husband would want it with some mashed potatoes.